Posted by Mollie Hamelund on January 19, 2019 in Hockey, Sports, Top Dawg. Top Dawg this week slides down to the ice rink, and even with the Bulldogs looking to turn around their recent struggles, a freshman has been gathering conference honors over winter break. 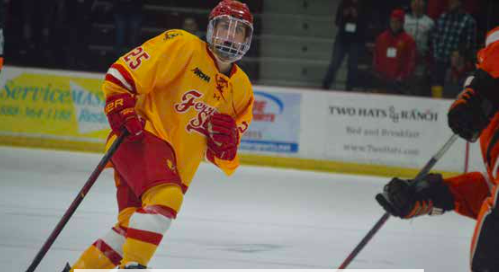 The Bulldogs saw improvement over the weekend, going from 12 goals allowed the first series to only five against Minnesota State University-Mankato, and it starts with Ferris freshman defenseman Cooper Zech. Zech was named Western Collegiate Hockey Association (WCHA) Rookie of the Week three times so far this season, including back-to-back weeks in December. The WCHA Rookie of the Month for December honor was also taken home by Zech, with two goals, six assists and eight total points in that month. Zech has not only found the back of the net in recent games but always seems to be on the ice when good things happen, maintaining his positive plus/minus score. With three goals coming over the break, Zech currently has six goals and 16 assists in his rookie season. Though he didn’t score in the weekend series against Mankato Friday, Jan. 11 and Saturday, Jan. 12, Zech led the team in shots Friday and added his 16th assist of the season Saturday. Zech’s progression began when the Bulldogs headed to Minnesota in December and split the series with the University of Minnesota (Minneapolis) Golden Gophers. Zech notched a power play goal and also added an assist. He was rewarded with his second WCHA Rookie of the Week. His impressive play continued heading to University of Alabama-Huntsville in the two-game series Jan. 4 and 5. Although the team split with both games going overtime, Zech gathered one assist and scored two goals, one being the game-tying goal in the Saturday night loss. Zech was rewarded as the WCHA Rookie of the Week for the second straight week. Zech and the Bulldogs head to Ohio 7:37 p.m. Saturday, Jan. 25, to face Bowling Green State University.